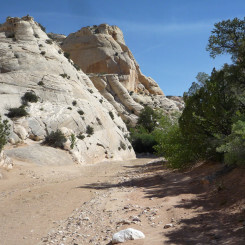 Round Valley Draw and Hackberry Canyon – Across Utah! 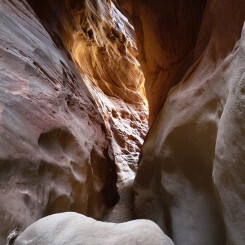 Round Valley Draw is an amazing slot canyon in Grand Staircase-Escalante National Monument. 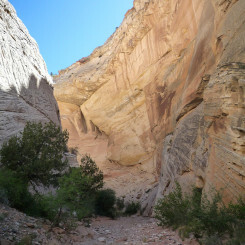 Though the slot is probably best done as a day hike, it is possible to make it through with a big pack and continue on a longer hike down Hackberry Canyon. 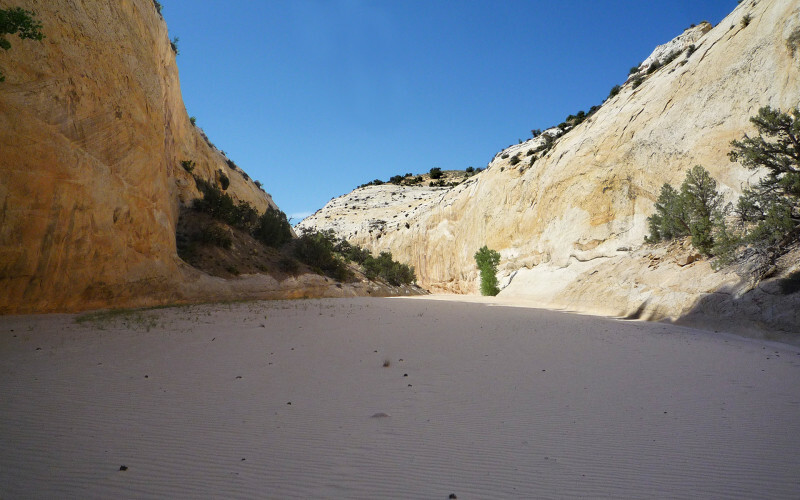 One could even do an extended hike linking the Upper Paria area via several possible loops. 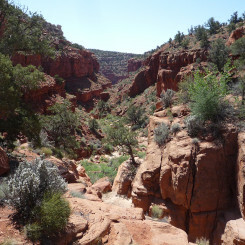 Thru hikers doing the Hayduke Trail will hike the length of both canyons. 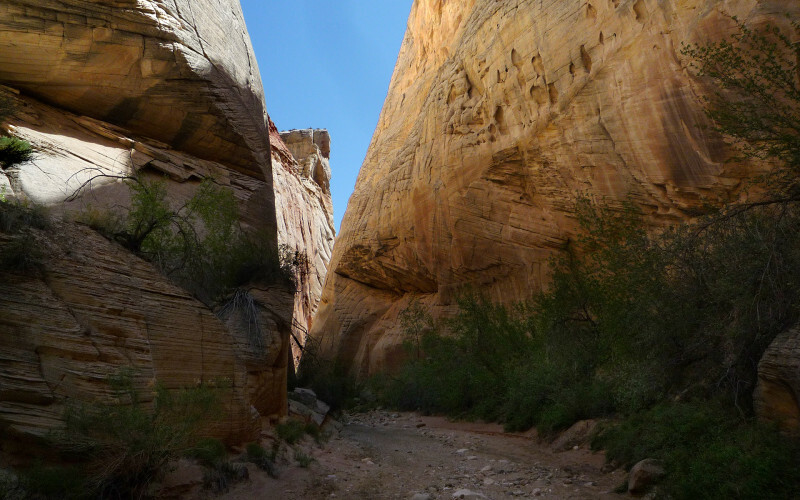 Access to Round Valley Draw is from a spur road just west of Grosvenor Arch. It’s just a few miles until the road crosses a wash and there’s a parking area. 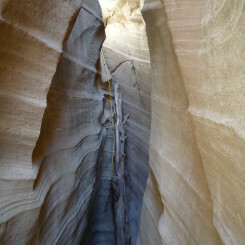 Walk down the wash for about a mile and then you will see the slot begin to form as a big crack in the earth. Climb down in. The initial downclimb can be tough, but hopefully a log will be there for an assist. 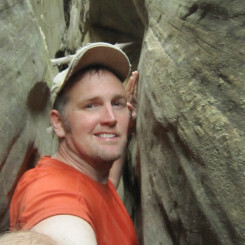 Climbing out with a big pack is difficult, but not impossible. 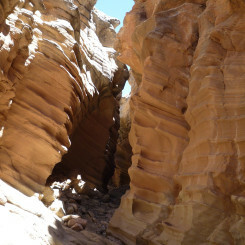 The first part of the slot is somewhat shallow, but there’s some interesting wavey/ribbed patterns in the sandstone. 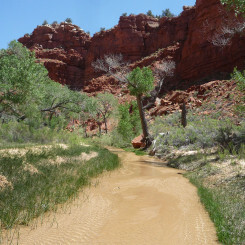 Round Valley Draw is usually dry, but there might be some mud/puddles early in the season or right after a storm. 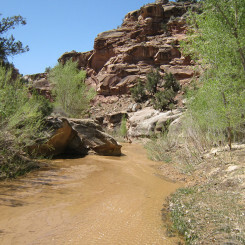 If continuing past the slot, don’t expect to see any water down canyon for 8+ miles. A little farther down the slot gets much deeper. There will be a few boulder jams where it’s necessary to scramble down. 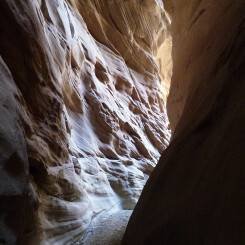 Below this section is gets fairly dark for a stretch as the narrows walls completely block out all daylight. 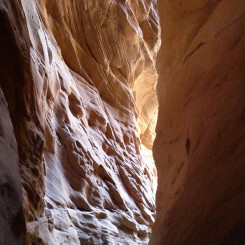 One emerges into an open space before the walls close in again for a short distance. Then the walls open a bit. 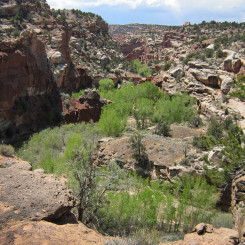 There’s a difficult exit route which climbs up a gulch on the right where one can walk the rim back to the top. 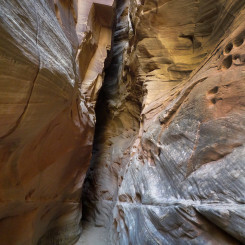 If doing a day hike, I’d personally just re-trace my steps through the slot as going the other direction will yield a new perspective. 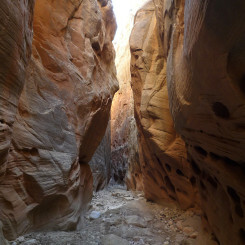 For those continuing down canyon the walls continue to get wider and wider apart. Soon one comes to the junction with Hackberry Canyon and then a little farther down Death Valley Draw enters on the right. At this point the canyon floor changes from rocky/gravel to predominately sand and the walking becomes much more difficult. 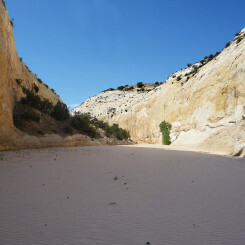 The next several miles are along sandy corridors walled in with white sandstone. 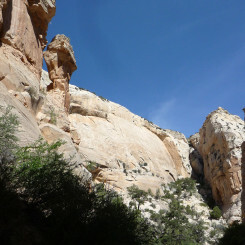 Small arches and toadstools are common sights along the canyon’s upper walls. 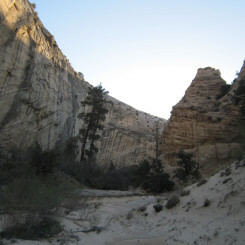 Booker Canyon comes in from the east (left) . Progress up this canyon is stopped after a mile or so by a dryfall. 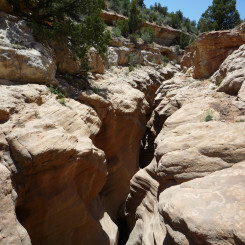 The canyon continues to be sandy and dry for several more miles. 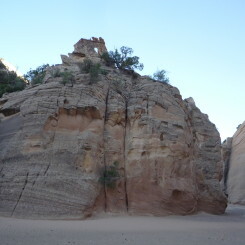 Eventually one will notice the sand changing colors and even becoming wet. 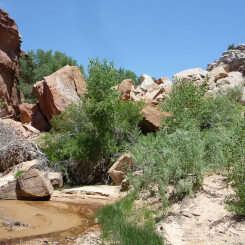 Soon there is vegetation all around and a stream begins to run. 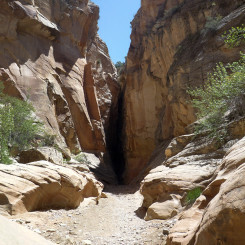 In this area is a route out of the canyon along on the west side known as the Upper Death Valley Trail. 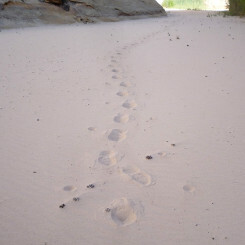 I’ve never tried it, but I wonder if this route would be a good way to bypass the sand in Upper Hackberry. 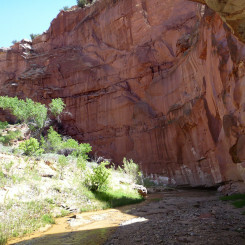 Below the stream the canyon gets more and more scenic. 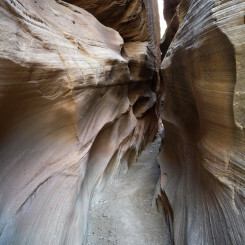 There are several colorful walls that tower — somewhat resembled those in Lower Muley Twist. Unfortunately with the now running streams comes cattle. At times the air stinks and the water is tainted by their presence. Soon one arrives at the junction of Stone Donkey Canyon. 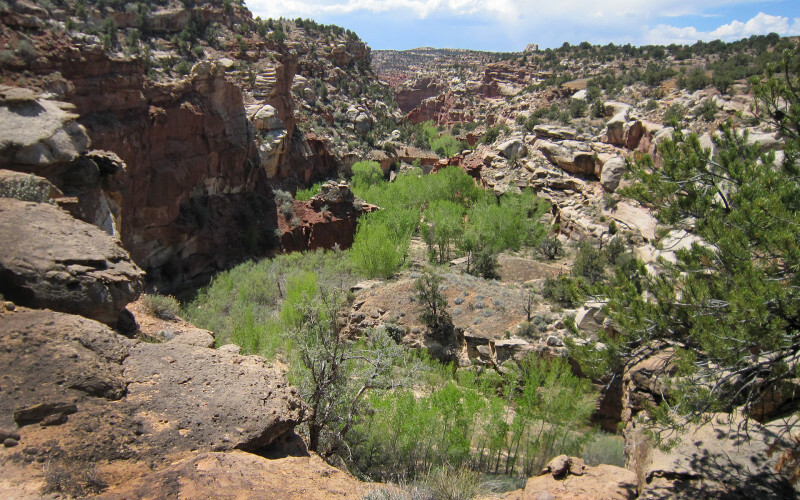 The mouth of this canyon is on the right and it looks overgrown and unappealing. 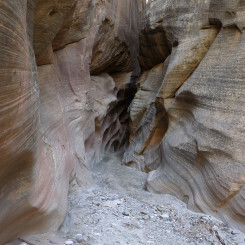 However, it’s a nice canyon and a few miles up is a super-skinny slot canyon which can be explored a ways from the bottom up. 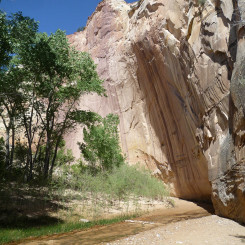 One can even exit the canyon and continue and connect with the Upper Paria. Read more in the Stone Donkey Hike Guide. 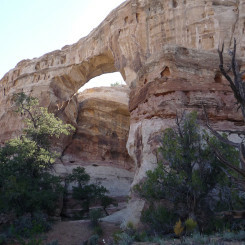 Below Stone Donkey it’s anther few miles to the next landmark in Hackberry — a major rockfall. 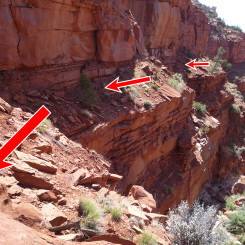 Just before the rockfall an old cattle trail crosses the canyon. 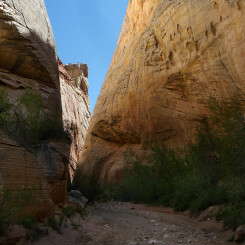 Exiting the canyon to the east, the route can be used to access Cottonwood Road. 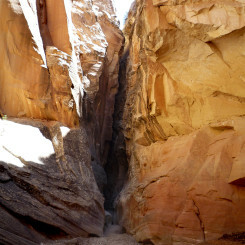 The route out and to the west is used to access Lower Death Valley. Below the rockfall Hackberry begins to open up a lttle more. 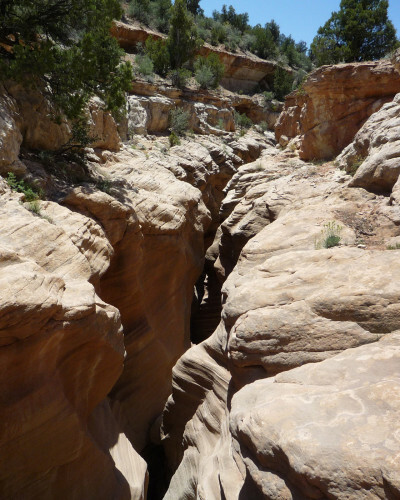 Soon a major canyon enters from the west. 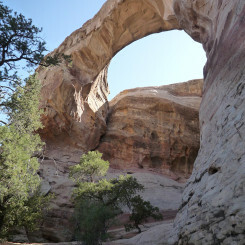 It’s up this canyon one will find Sam Pollock Arch. 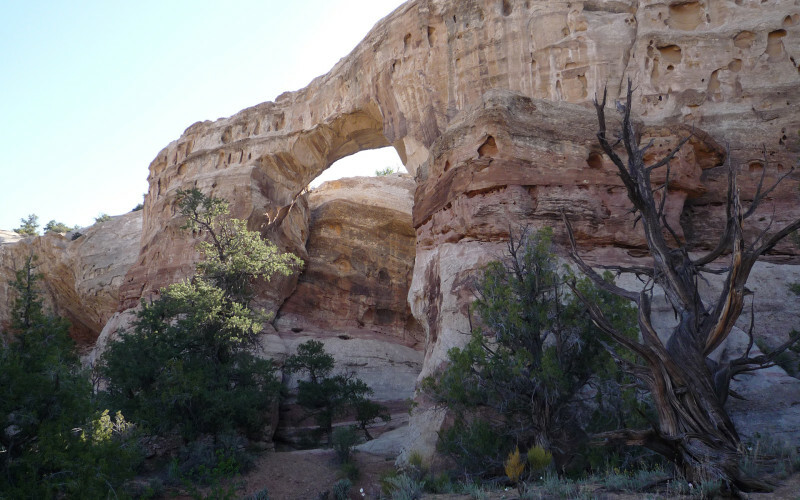 It’s about 2 miles up to the arch, but the route requires some scampering over boulders and then a semi-sketchy ledge to bypass a dryfall. ** Note as per comments below, as of 2016, this bypass route my no longer be safe and thus one should reach the arch via Lower Death Valley Trail instead. 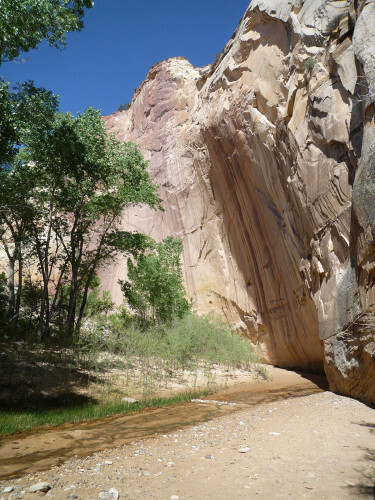 South of the Sam Pollock canyon, the Hackberry opens up even wider and some coloful mudhills come into view on the lower slopes. 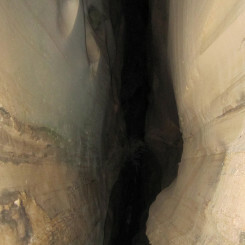 Then the canyon abruptly turns east and gets narrows again as it cuts through the Cockscomb formation. There’s a cool rock pinnacle in this section. 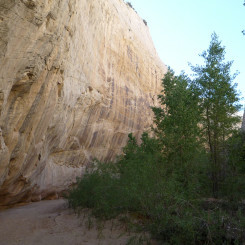 Hackberry ends at Cottonwood Wash and there’s a trailhead parking area just off Cottonwood Road. 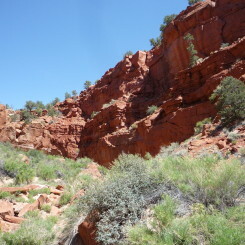 This is the same TH which can be used to access Yellow Rock. 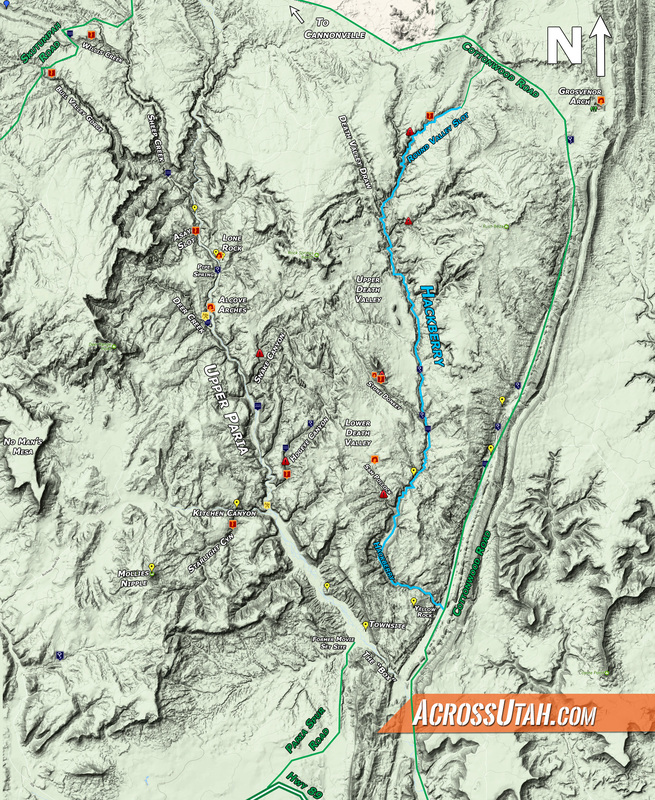 Wonderful detailed post and I especially appreciate the map! I’m trying to sort out how to find this route on your interactive map though and can’t quite figure that out? Apart from the scramble in at the start of Round Valley draw, are there any other climbs in the main route. Planning on backpacking this route with my dogs and while I’m prepared to lower them down at the round valley entrance, want to make sure I’m prepared for the rest of it. Also the first water source is 9.5 miles in from the start correct? Is there a place to camp right around there? 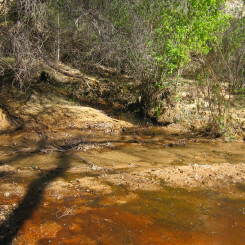 Are the water sources reliable? Thanks for the help! Yeah — you can zoom into that section on my Master Map, but really there is more detail here. However, I’m in the process over re-doing the Master Map (and linking to detail maps) — so stay tuned for that. There are no other obstacles in Hackberry, but the Round Valley Draw might be a challenge with the doggies. 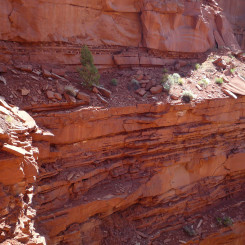 The initial drop in and one other rockfall both require about 10′ climbs. 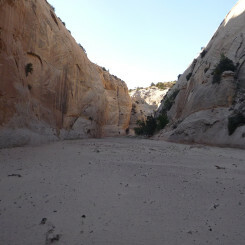 Upper Hackberry really is completely dry (minus possible pools in the slot.) 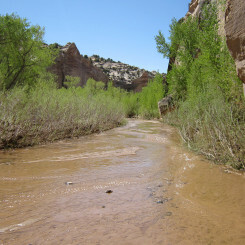 There is decent camping once you get down to where the water begins to flow (in fact one old cowboy camp right near the first spring.) Have fun. 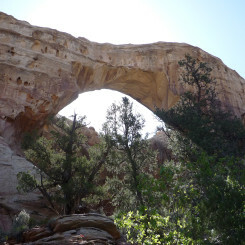 About ten years ago I’ve hiked up Sam Pollock Canyon to the arch. The dryfall bypass route was a bit exposed but makeable. 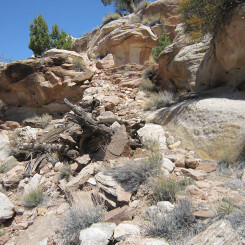 Last year (2016) I rehiked this canyon up to the dryfall and found the bypass destroyed by recent (?) rockfall. It is now extremely dangerous! 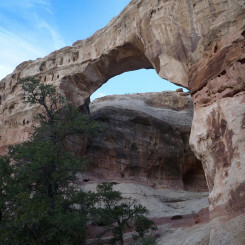 If someone wants to see the arch, it’s a lot safer to use the Lower Trail out of Hackberry Canyon or to come via Hogeye Canyon. Wow — great info. Thanks, Peter — I will make a note of this. I’m guessing that if the new slide is along that exposed section, it might never be safe again (similar to the Kitchen Falls bypass of yesteryear). 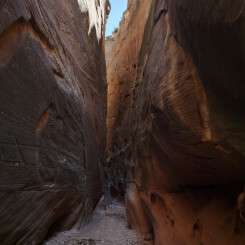 UPDATE: I talked with someone who hiked this last year (2018) and said it was once again safe. She even showed me photos and it looked no worse than years ago — so evidently the obstacle is now gone.